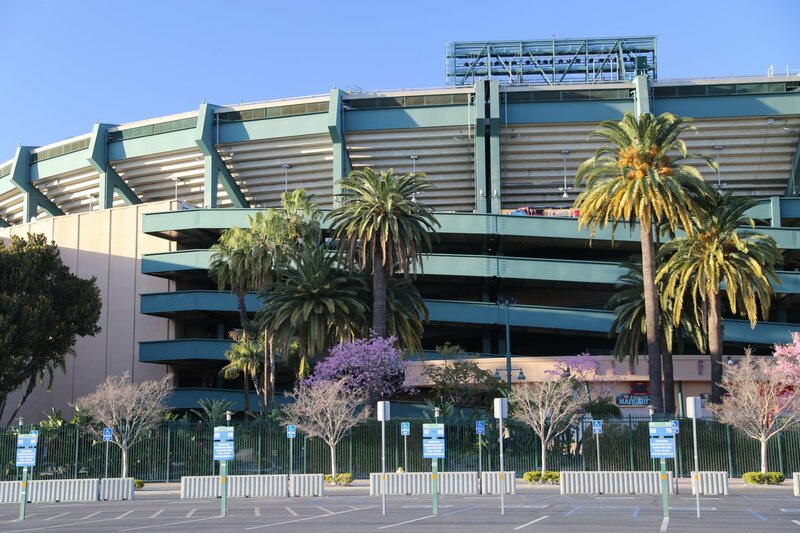 The following prominent stadiums and arenas are located within the greater LA and Orange County metropolitan regions. 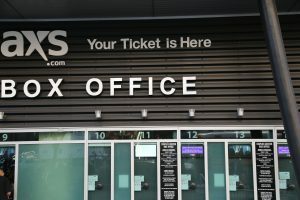 We have also reviewed many venues & theatres here. 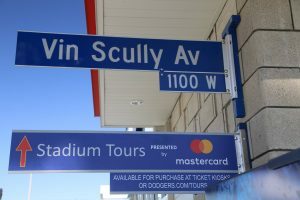 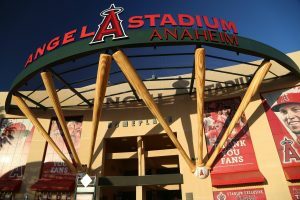 Angel Stadium of Anaheim (or “the Big A”) is located at 2000 E Gene Autry Way just off of the 57 freeway in the heart of Orange County just a few miles from Disneyland. 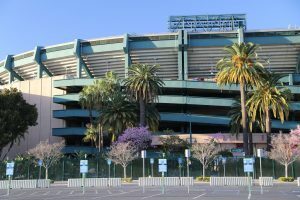 Similar to how the Oakland Coliseum is located next to the Oracle Arena up in the San Francisco Bay Area, Angel Stadium is located within a very short distance of the nearby Honda Center. 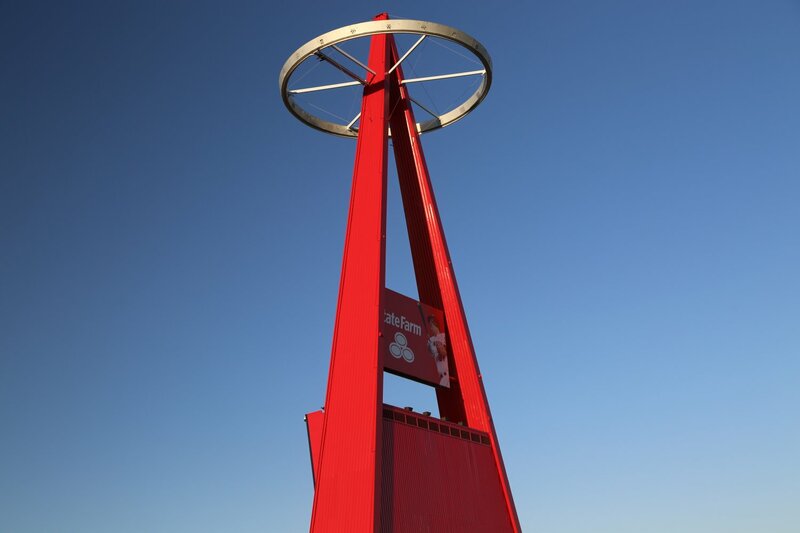 The iconic “halo” is easily seen – iconic this tall red structure is located on the east side of Angel Stadium and lights up after every Angels win. 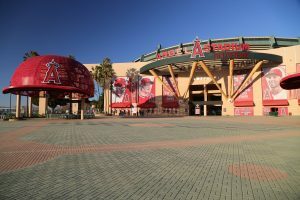 The stadium is home to the Los Angeles Angels – despite their ‘Los Angeles’ name, this is actually a misnomer as this is Orange County, not Los Angeles. 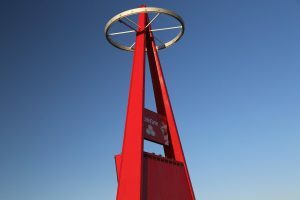 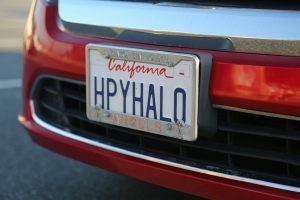 Rather the name is in tribute to the original Los Angeles Angels who played in the city of Los Angeles. Note that the Los Angeles Angeles, named after a Pacific Coast League team played their first season in Wrigley Field in Los Angeles. 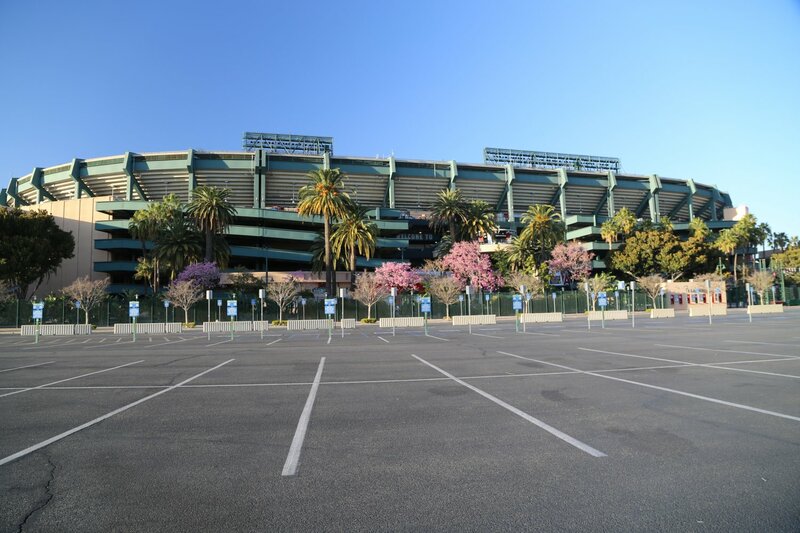 And also note that this original ballpark opened one year before Wrigley Field in Chicago (both stadiums were named after the same individual, the Chicago chewing gum magnate, William Wrigley Jr). The eye-catching steel looking building on the east side of the stadium is the Anaheim Regional Transportation Intermodal Center (a fancy name for a public transportation center, otherwise known as ARTIC) is about a 20 minute walk away from the stadium (despite being geographically located very close to Angel Stadium). 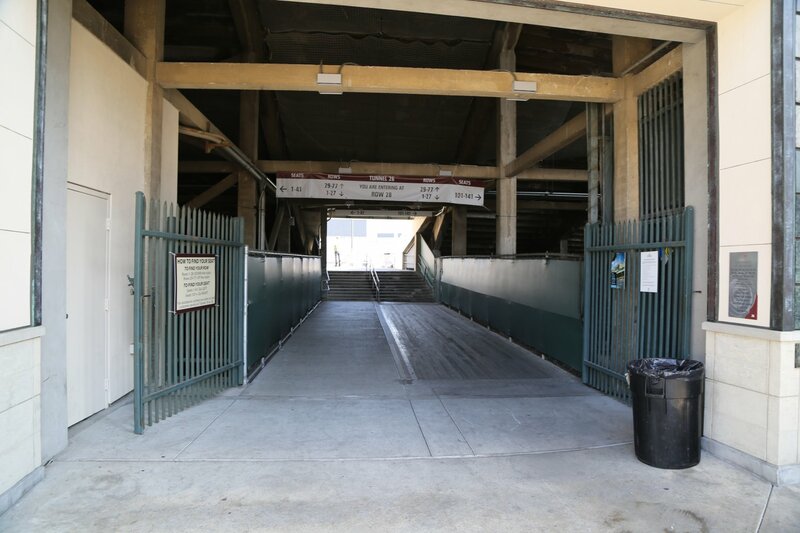 The stadium is accessible via 8 gates (during games) – only several access gates are open when there are no games. 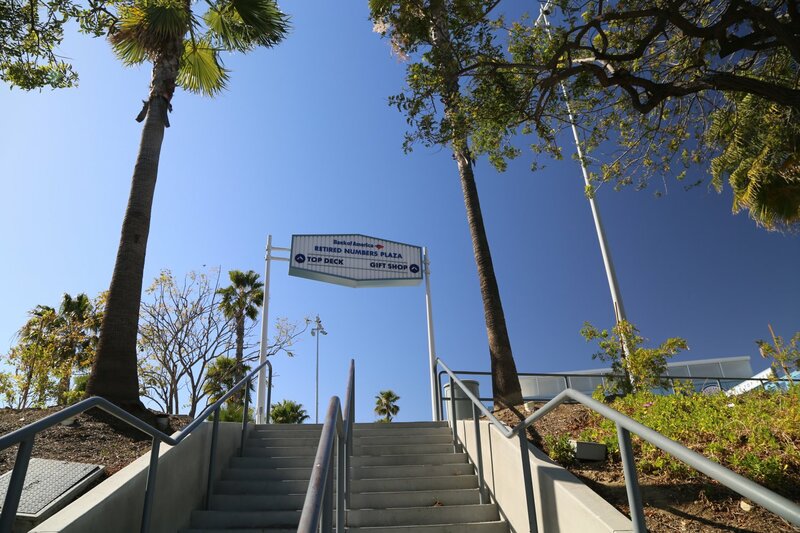 During non game times we have always entered through the Express Entrance located on Orangewood Avenue on the south side of the stadium. 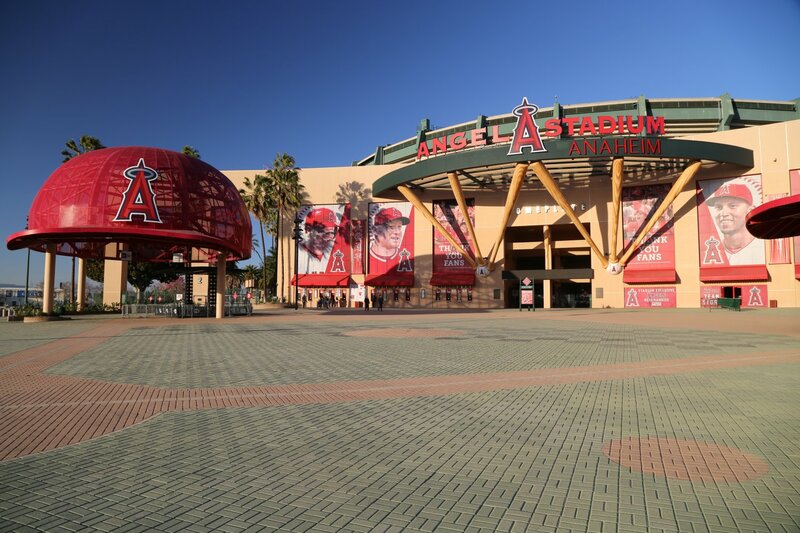 This is also the best access to the Angels Team Store (which is open on both game and non game days). 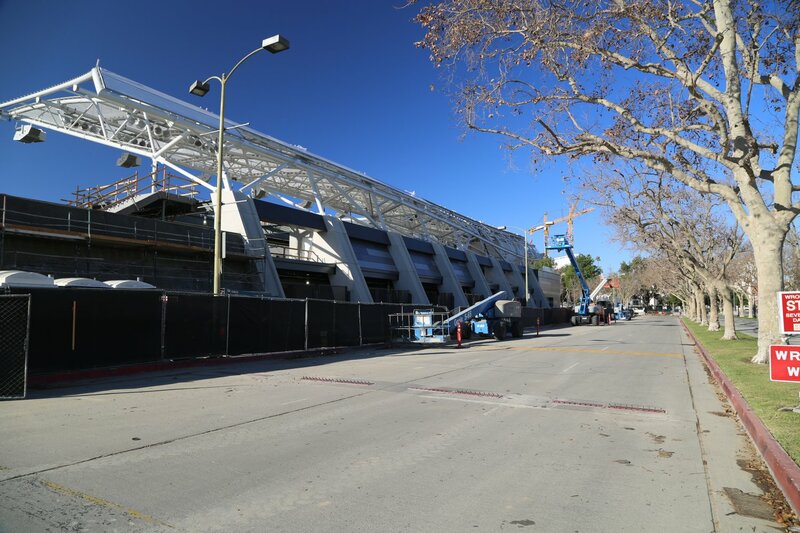 Banc of California Stadium is located in Exposition Park at 3939 South Figueroa Street. 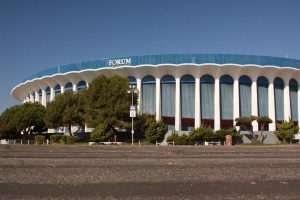 Old timers who used to go to events here in the 1960’s (such as a friend of ours) remember this site as home of the Los Angeles Memorial Sports Arena. 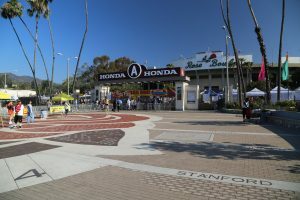 It was torn down in 2016 (the last performer to play here was Bruce Springsteen). Once the Los Angeles Memorial Sports Arena was torn down, no time was wasted in the ‘ground breaking’ of this new stadium. Construction started in 2016 and the new stadium was opened by mid 2018. 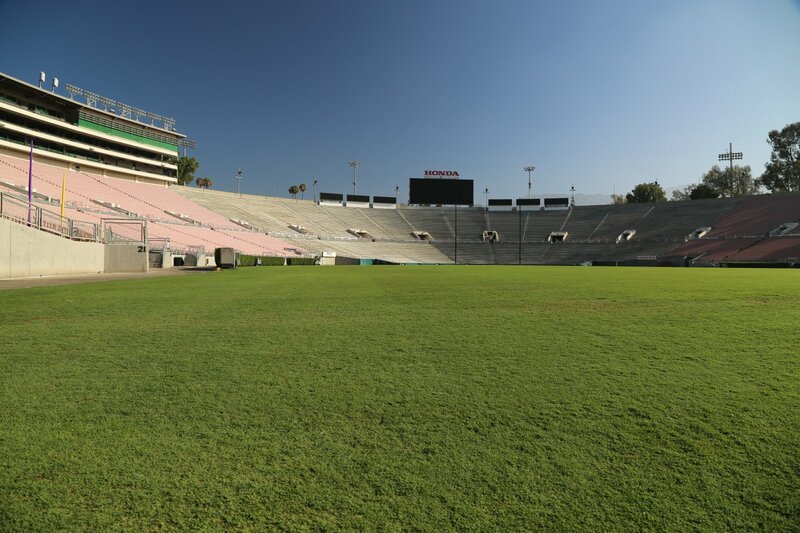 Incidentally this was the first Los Angeles based open air stadium built in 55 years. 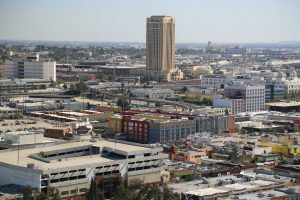 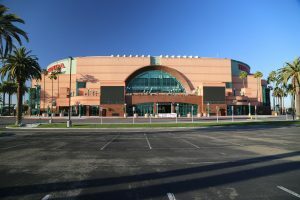 Citizens Business Bank Arena is located right next to the 10 Freeway in Ontario – about 35 miles east of downtown Los Angeles. 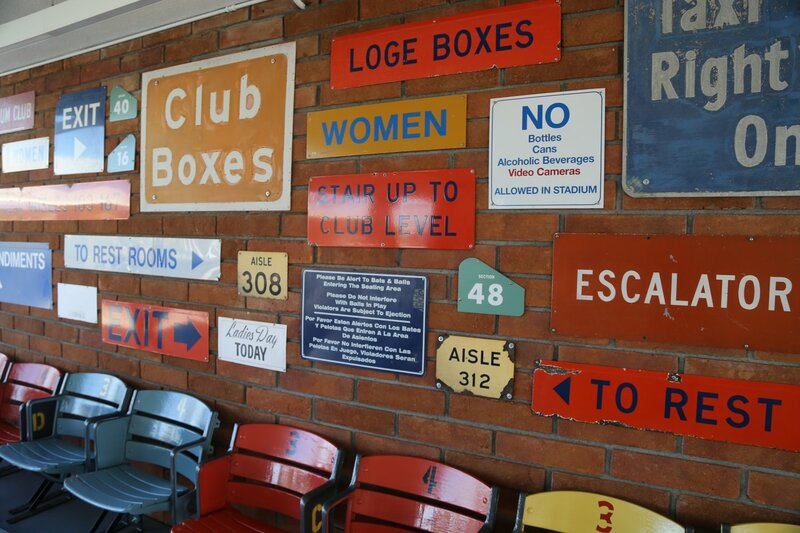 Old timers, or perhaps not so old – will remember coming to the Ontario Motor Speedway. 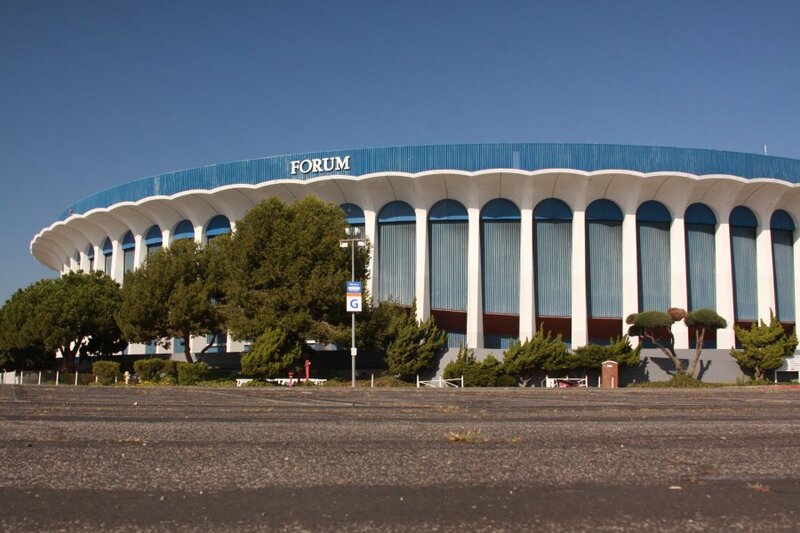 The arena sits almost in the footprint of this old speedway. 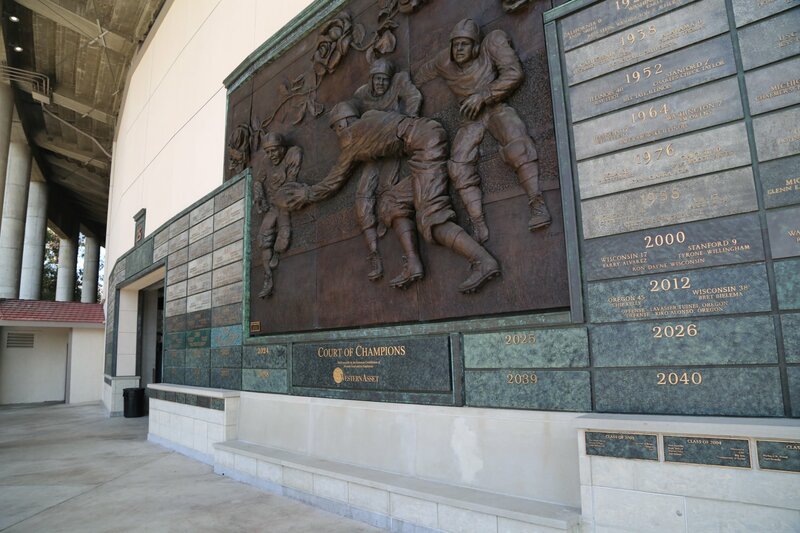 Once inside check out the “Memory Lane” exhibit – located between sections 116 – 118. This outlines some of the speedway history with some intriguing photos. 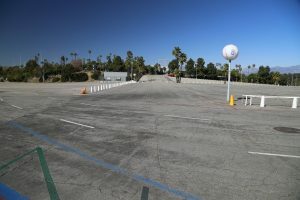 There is plenty of parking surrounding and the arena itself has about 9,500 permanent seats – seating can be expanded for larger events. 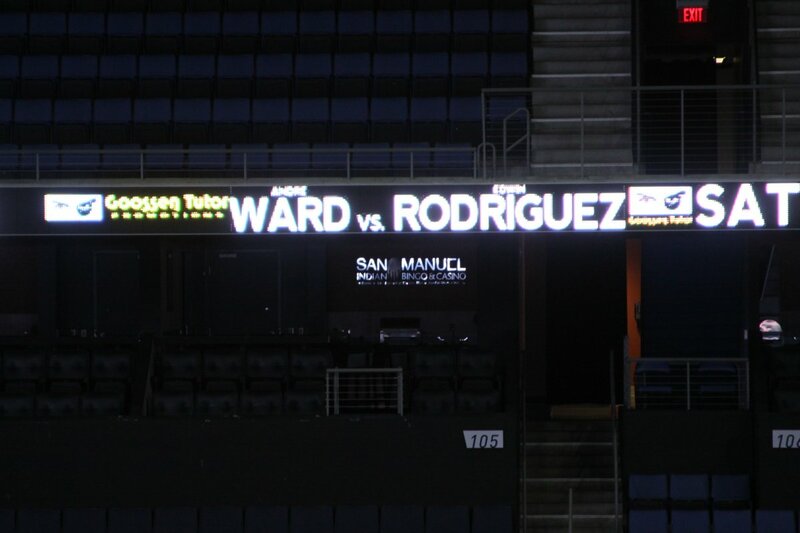 The arena is very versatile on what is can support in the way of entertainment – it has hosted big name musicians in the past (Neil Diamond, Cher etc) and also a number of sporting events including some big name boxers. 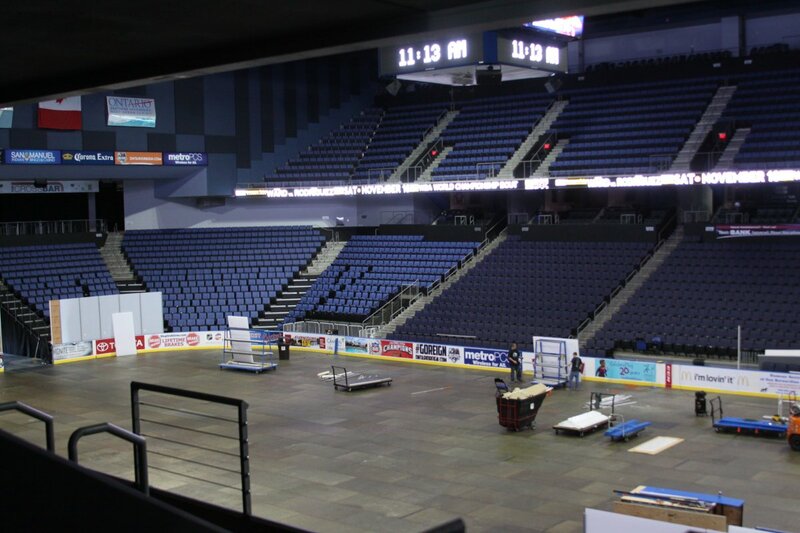 It is also the home of the Ontario Reign ECHL ice hockey team. 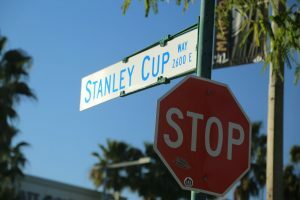 One other interesting historical note is Ontario used to have a lot of vineyards. 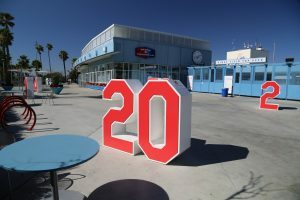 There is a historical display located near “Ciao Now”, sections 101 and 102 outlining some of the vineyard history on site. The Italian Vineyard Company used to run one of the largest vineyards in the country in the early 1990’s and their vineyard used to be planted on this site. Dodger Stadium is located right off the 110 Freeway just north of downtown Los Angeles (on the other side of the freeway from Chinatown) next to Elysian Park at 1000 Elysian Park. 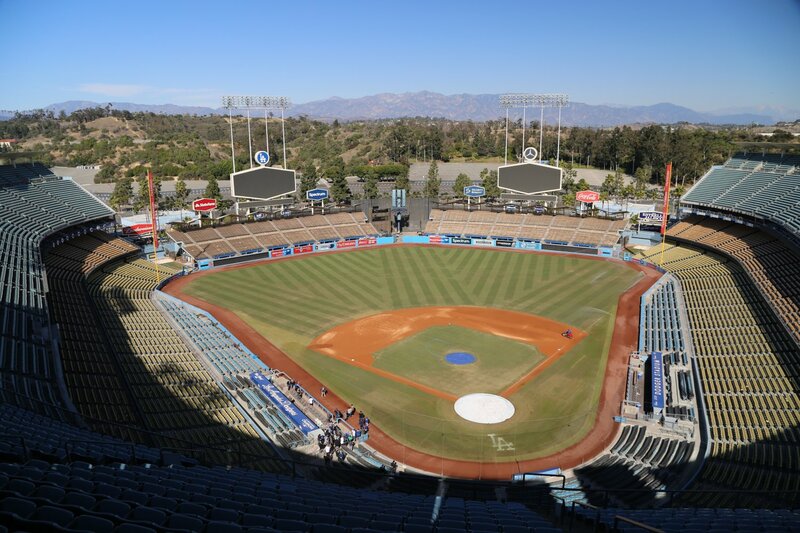 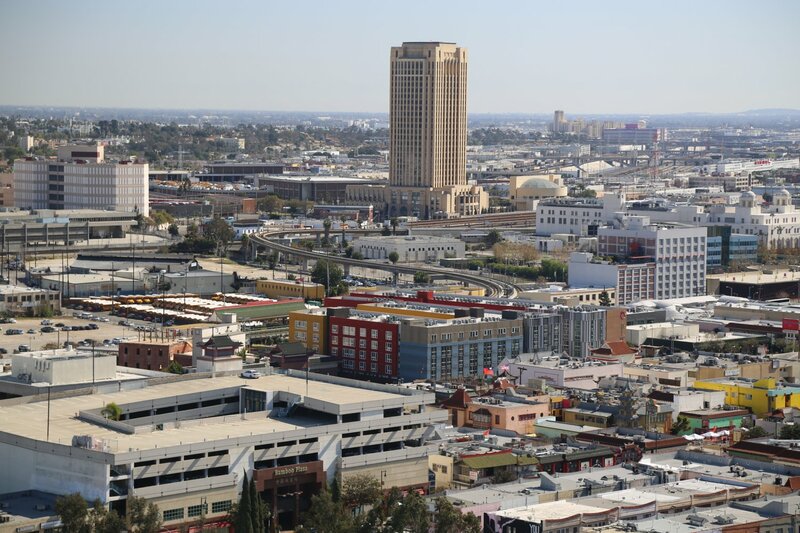 This is home to the Los Angeles Dodgers and sits in the hills just north of downtown and on a clear day there are excellent views of downtown and the surrounding hills. This is the 3rd oldest stadium in Major League Baseball (opened 1962) behind the storied Fenway Park and Wrigley Field. 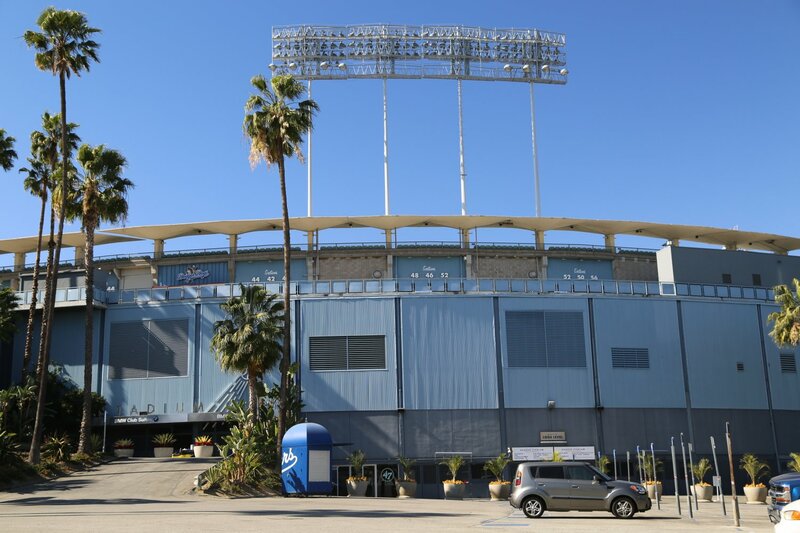 Walking into this iconic ballpark is inspirational for a number of reasons including because of the history of the park and its inspirational location. 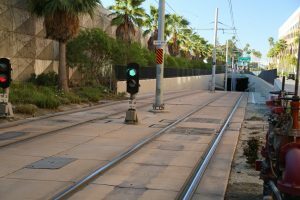 Surrounded by freeways including the 5, the 101 and the 101 – access is from either of these freeways or from Sunset Blvd. 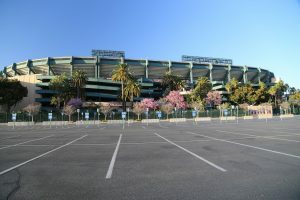 Stadium Way circles the west side of the park and provides a number of gate entrances to the stadium (there are 5 gate entrances signed A through E). 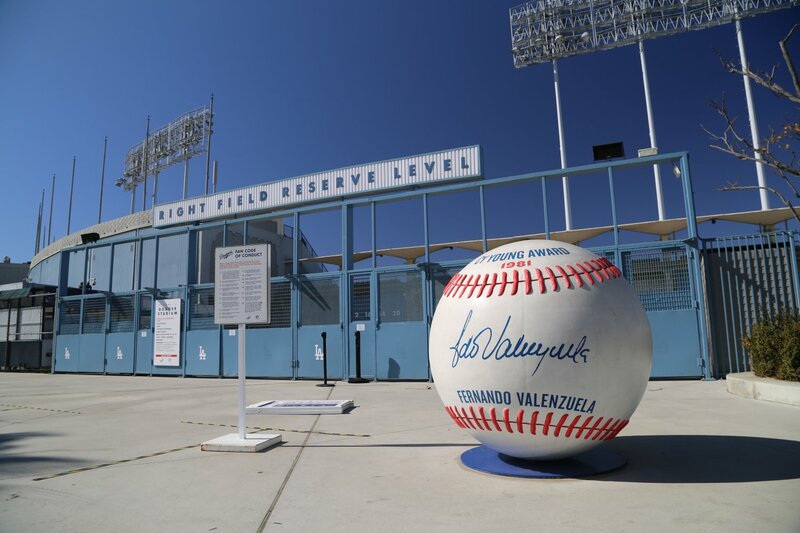 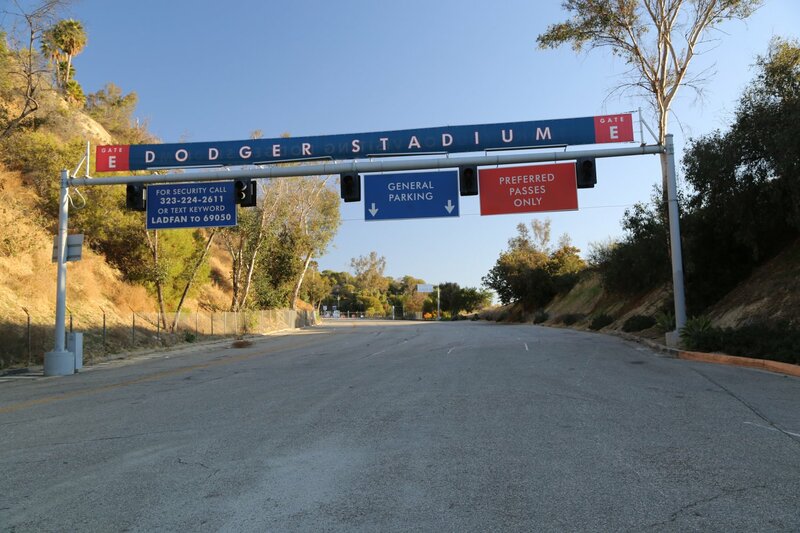 During non game days, enter through Gate A (Sunset Gate) and follow the blue line in the parking lot up to Parking Lot P which is where the Dodgers Store is located at the Retired Numbers Plaza. 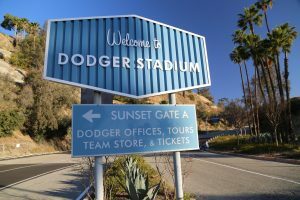 Locals refer going to Dodger Stadium as “going to the ravine” (Chavez Ravine) – a testament to its specific geographical location. 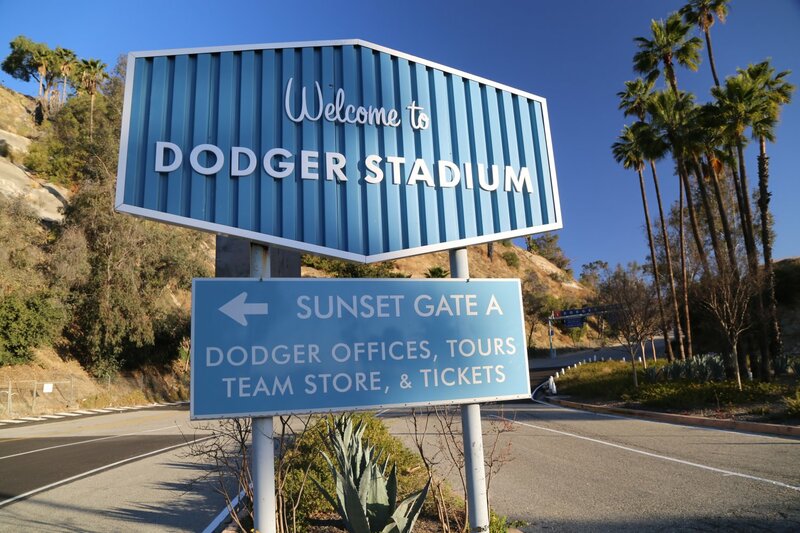 In the same grain as the Hollywood Sign, the Dodgers have their own answer to this built in the hills. The “Think Blue” sign lies just north of the stadium in the hills of Elysian Park. Visitors can view the stadium on non game days during their normal hours from the upper deck next to the Dodger Store. 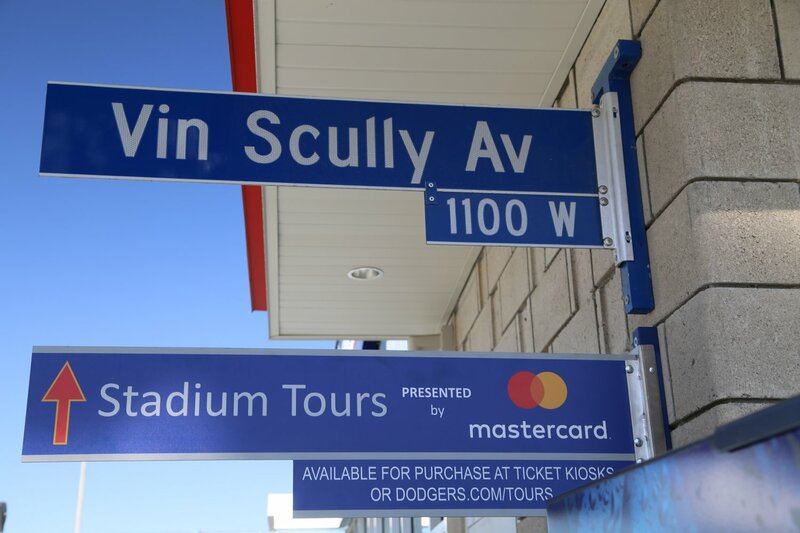 Those looking to see the stadium even more up close and dig into its rich history should strongly consider booking a tour of the stadium. 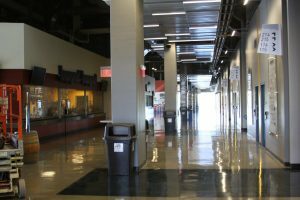 The tour lasts about 90 minutes and usually includes a visit to the dugout, a walk onto the field and access to several VIP areas. 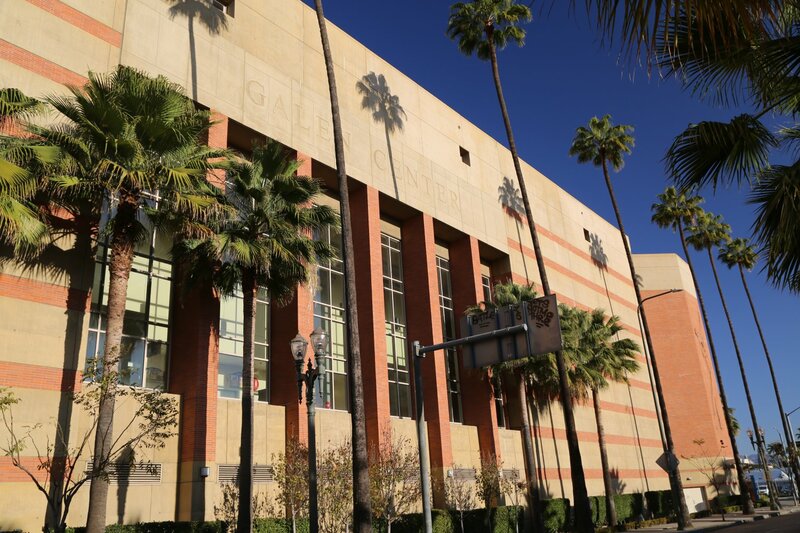 Galen Center Pavilion is located on the west side of the 110 freeway just south of downtown Los Angeles (you can easily see it from driving either direction on the freeway). 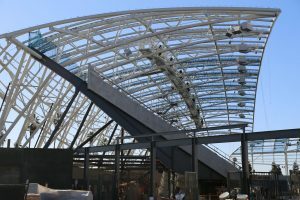 This handsome structure opened in 2006. 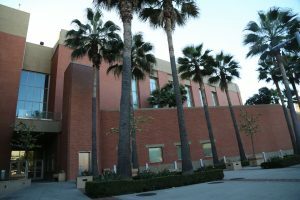 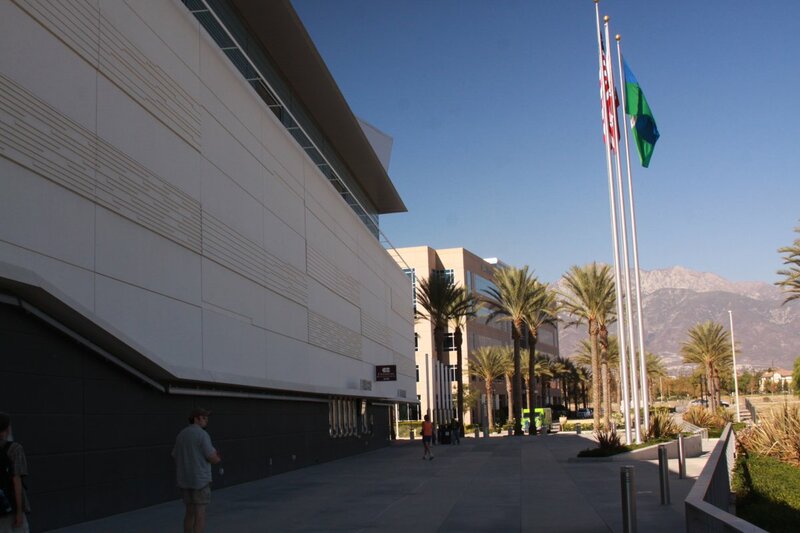 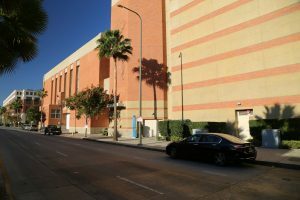 It is the home to the USC Men’s Basketball and Women’s volleyball teams as well a number of other events including high school and various youth sports. 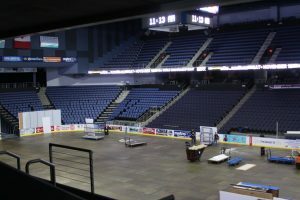 The pavilion seats over 10,000 people. 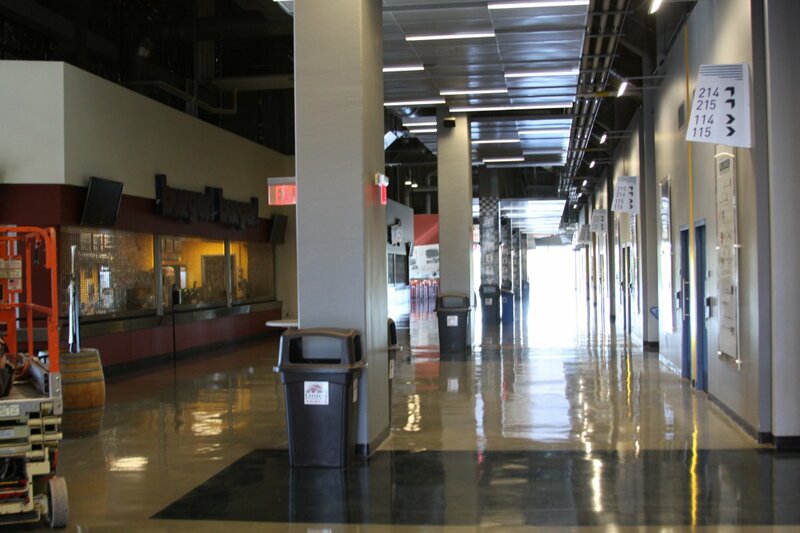 Note that only clear bags of a certain size can be brought into the pavilion during game day events. 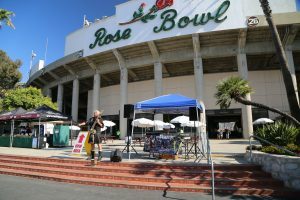 The namesake is Louis Galen, an area banker and long time USC fan who donated a significant amount of “change” to help fund the project. 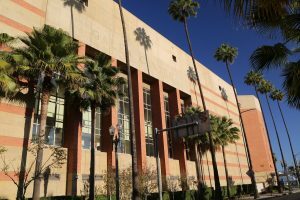 It is interesting to note that prior to the Galen Center the USC basketball team had no home on campus – rather over the years they played at various venues around the city. USC had plans to build an on-campus indoor arena for about 100 years – this was a much needed addition to the campus! 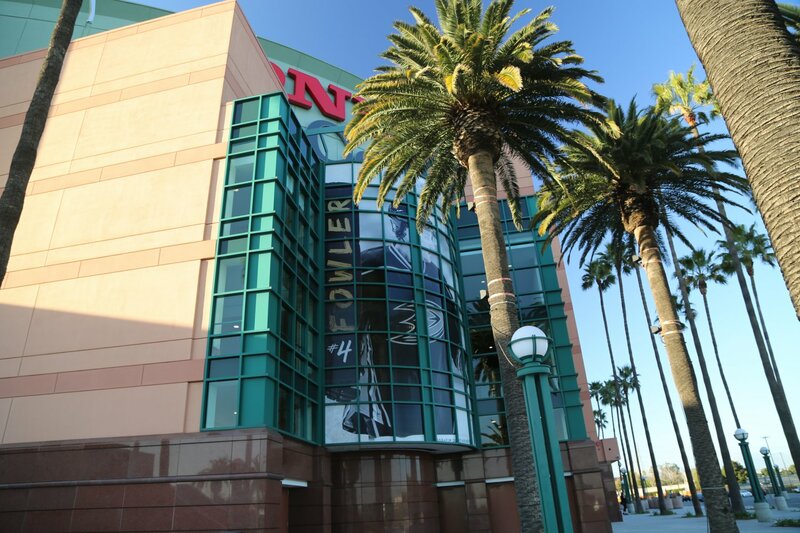 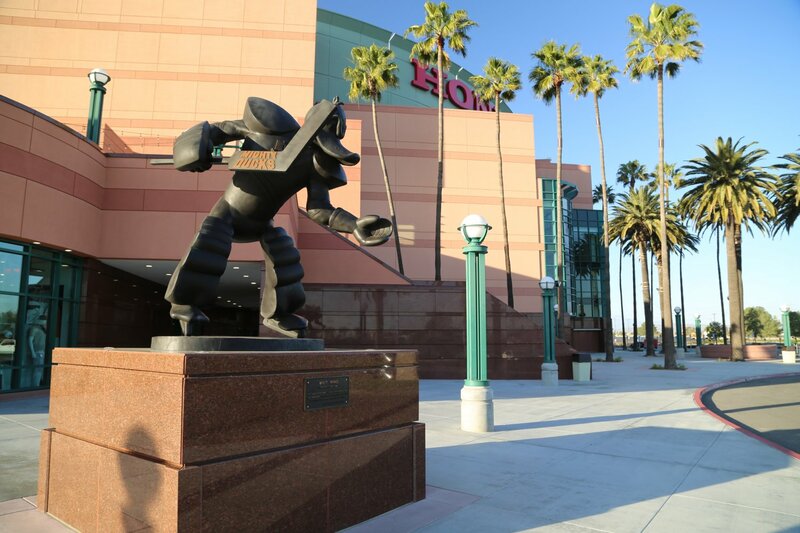 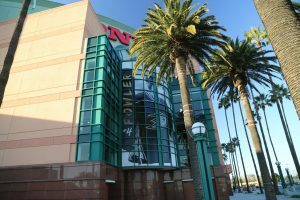 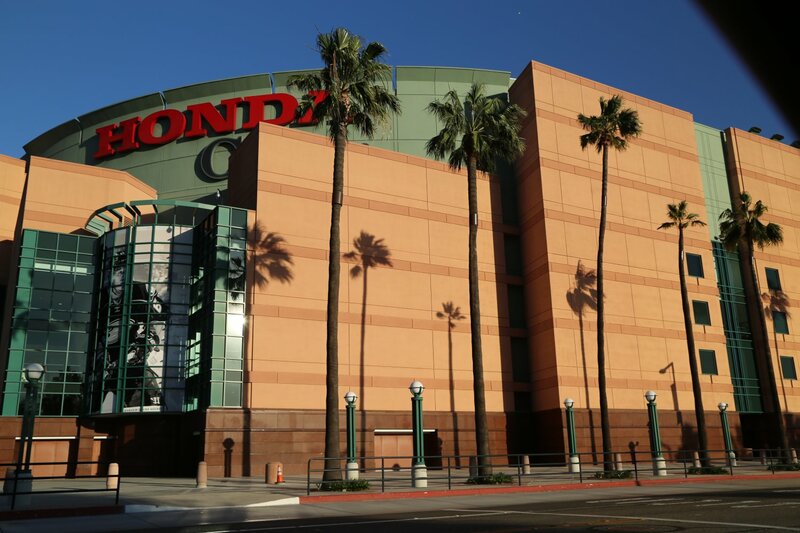 Honda Center is located in Anaheim almost across from Angel Stadium at 2695 East Katella Ave. 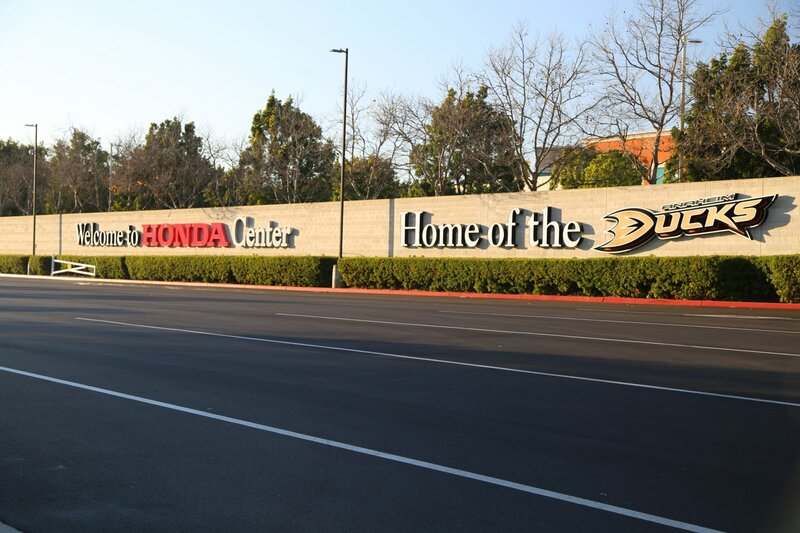 It is still often referred to as “the pond” based on part because of its former name of Arrowhead Pond. 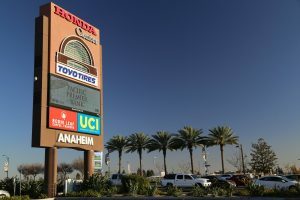 Currently owned by the city of Anaheim the center opened in 1993. 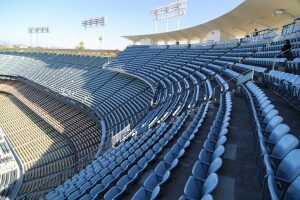 It seats over 17,000 people. 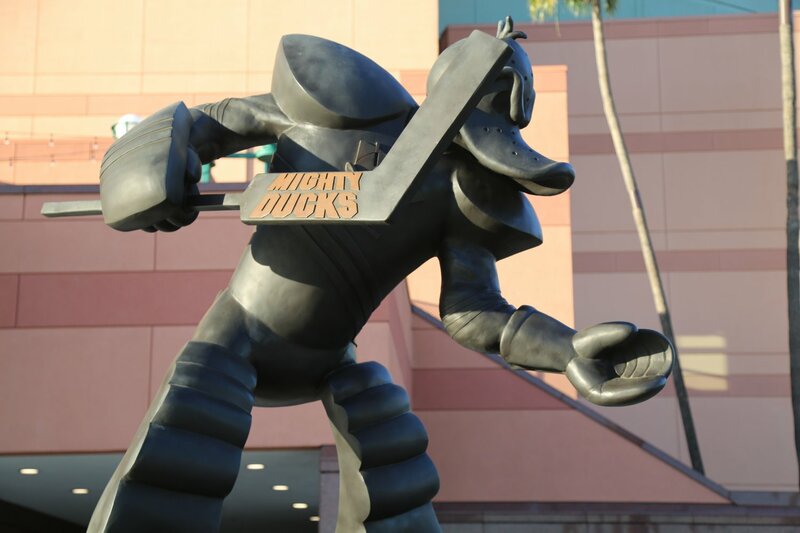 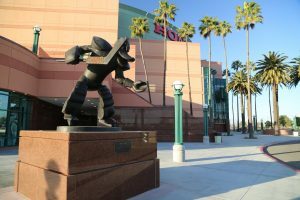 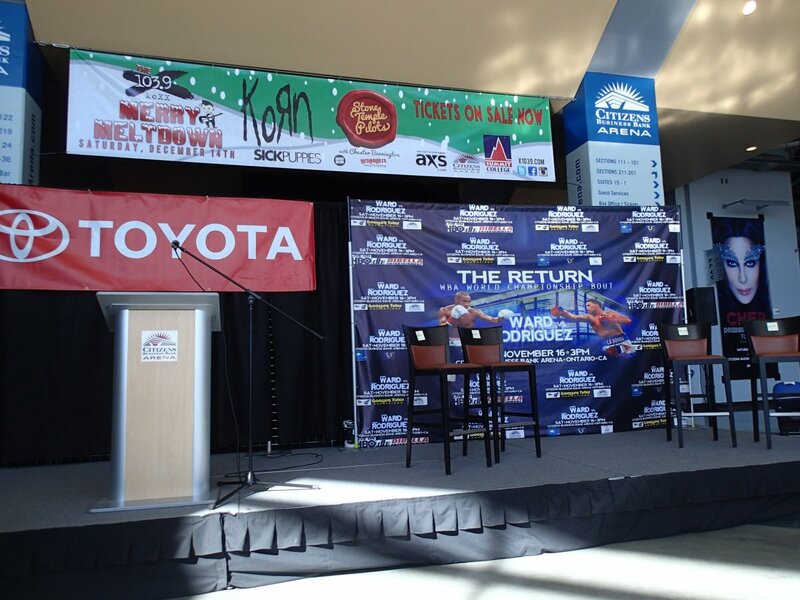 This modern event center is home to the Anaheim Mighty Ducks, the professional Hockey team. 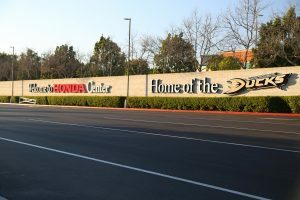 It has been the site to several NHL playoff series and saw the Ducks emerge as Stanley Cup Champions in game 5 in 2007. 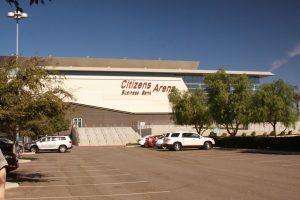 Not only used for hockey, the pavilion is a common venue for big name musical acts including in the past, The Rolling Stones, Maroon 5 and Fleetwood Mac. 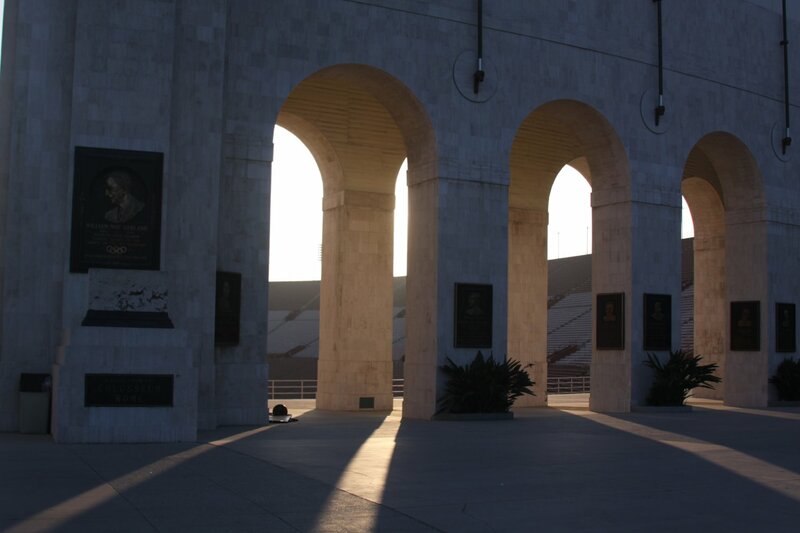 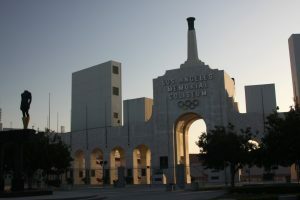 Los Angeles Memorial Coliseum is located within spitting distance of the 110 freeway at 3911 S Figueroa St in Exposition Park. 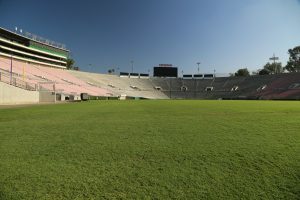 The Coliseum borders the LA Sports Arena and is fairly close to the prestigious University of Southern California (USC). 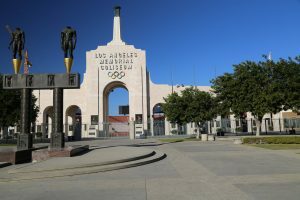 The Coliseum was constructed in the early 1920’s having been designed by a father son team who also helped design LA’s Union Station and the famed City Hall. 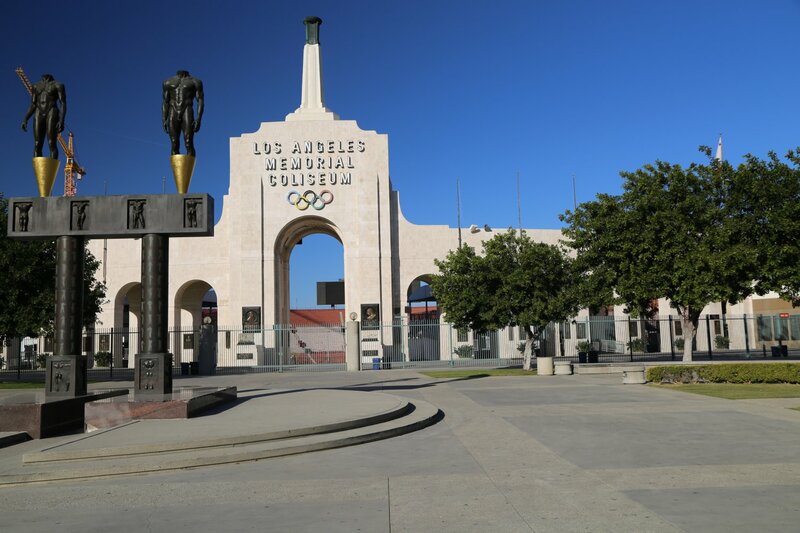 This is a very historical sports arena, having played host to two Olympic summer games and will host the Olympics again in 2028 (only stadium in the world that holds that bragging right), two Super Bowls and one World Series. 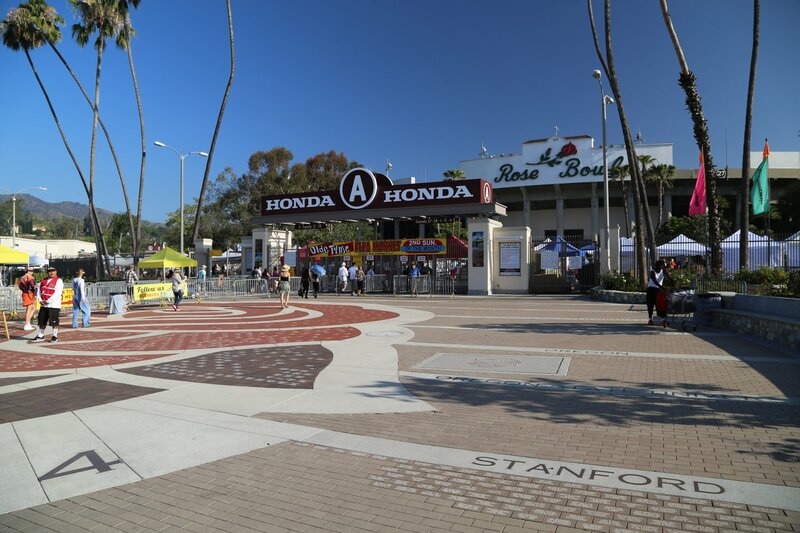 This also happened to be the finish on a AIDS SF to LA fundraising ride we rode a number of years ago. It is currently home to nearby USC’s football team. A number of big name entertainers also perform here. 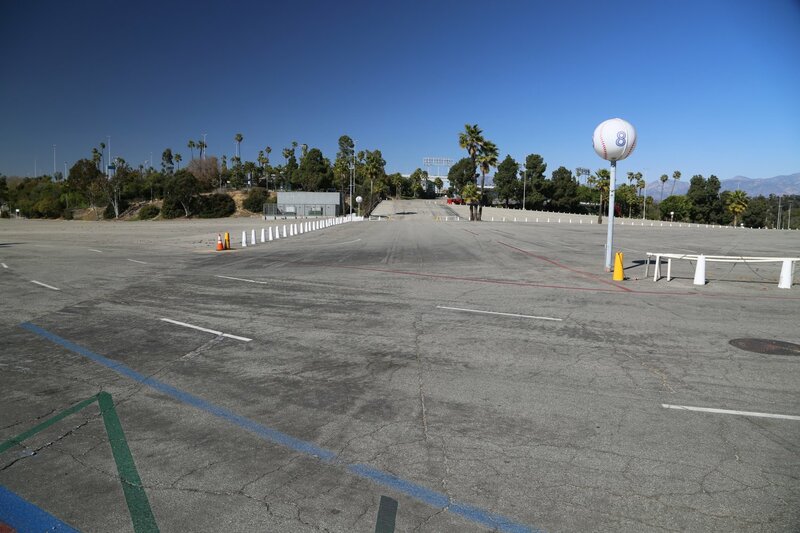 It is one of southern California’s largest venues – its all time record crowd topped out at over 134,000 people! 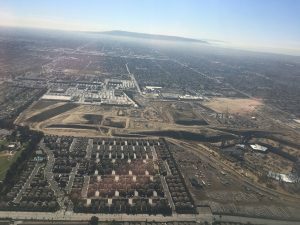 Los Angeles Stadium at Hollywood Park is scheduled to be completed in time for the 2020 NFL Season. 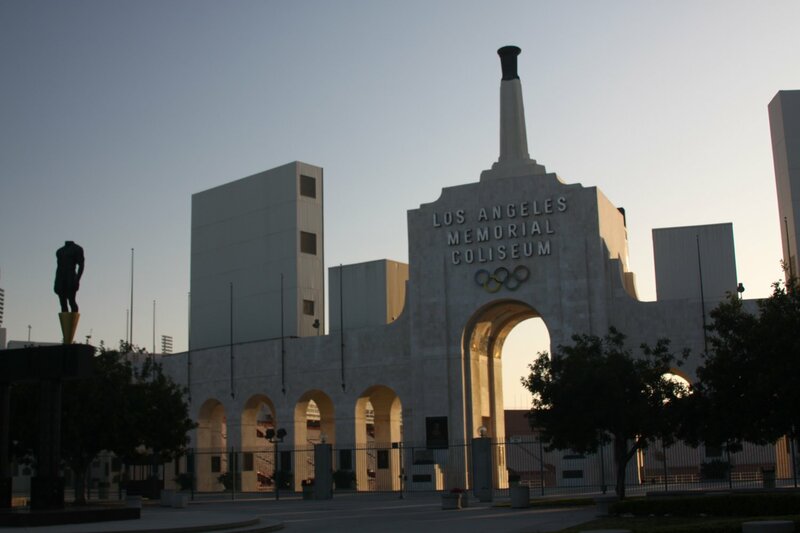 Already major events are scheduled here including the Super Bowl in 2022 and the opening ceremonies of the Olympics in 2028. 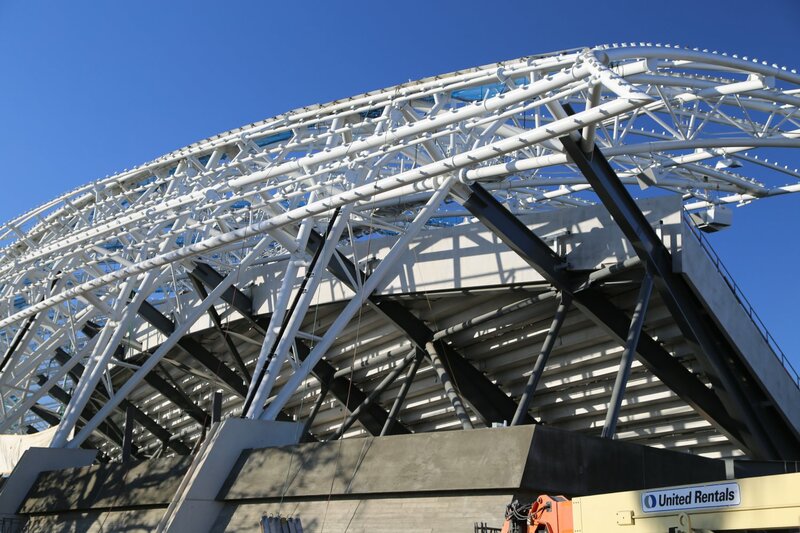 This massive stadium and accompanying infrastructure is being built at a cost of about 3 billion USD. 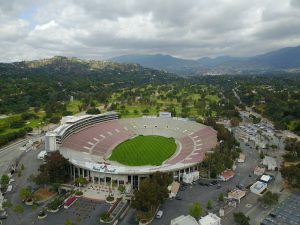 Once completed it will be the home for both the LA Rams and the LA Chargers (until one of the teams invariably moves out of town) as is so typical of certain NFL cities including Los Angeles and Oakland. 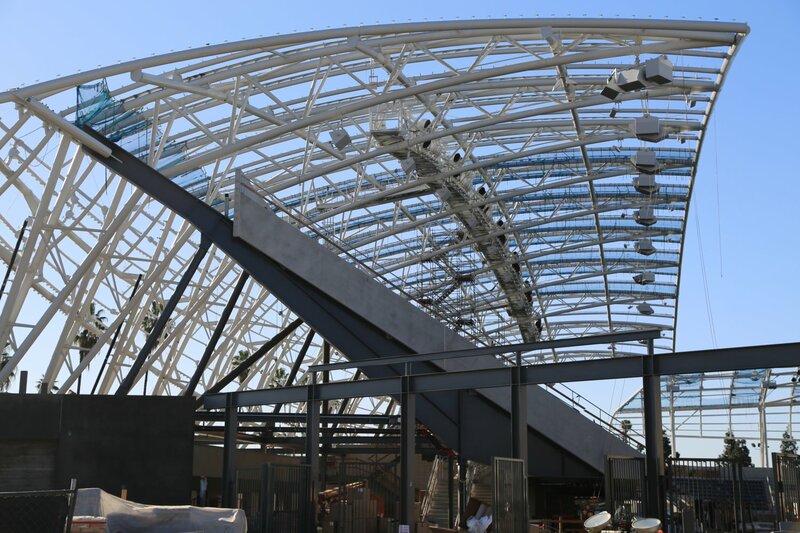 The grounds of this massive entertainment center cover 290+ acres and include the actual stadium as well as an impressive arena (approximately 6,000 seats). 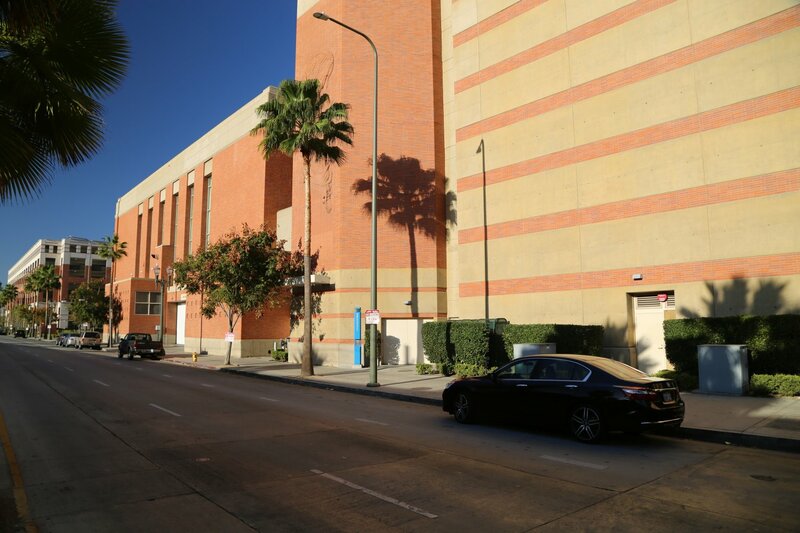 Also on site are a number of residential ‘neighborhoods’ and space for both business and commercial use. 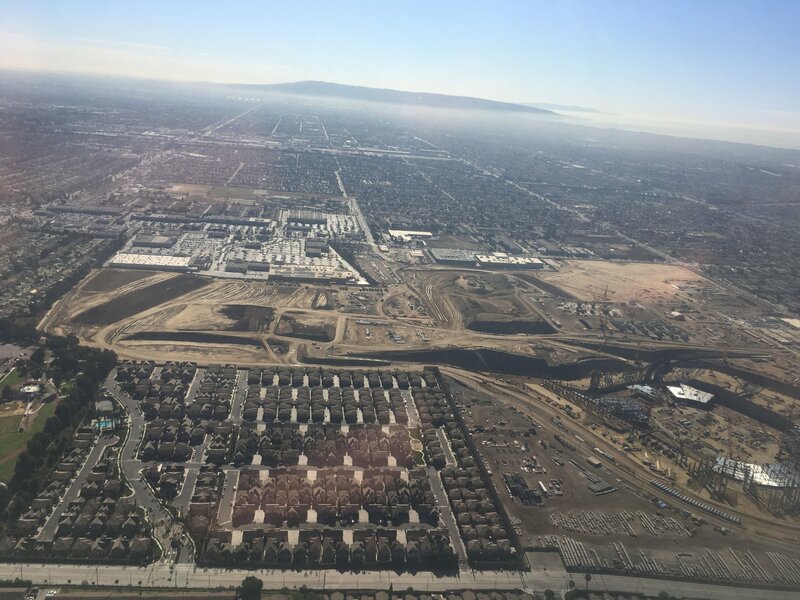 Located in Inglewood directly east of LAX and very much in the flight path of descending planes. 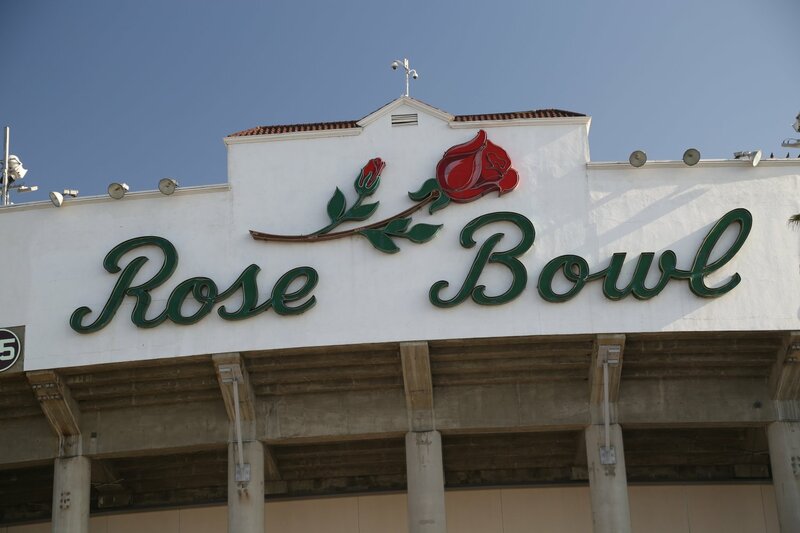 Rose Bowl is located at 1001 Rose Bowl Drive, not far off the 210 Freeway. Directions to this historical location are well signed from all major intersections. The Rose Bowl dates to 1922 and is most famous for serving as home to the Rose Bowl College Football game every January 1st. 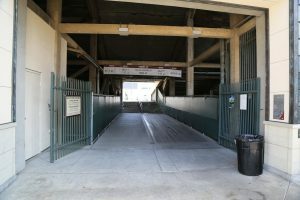 Unfortunately access is limited during non events so you can only see the stadium through the tall metal gates in front. 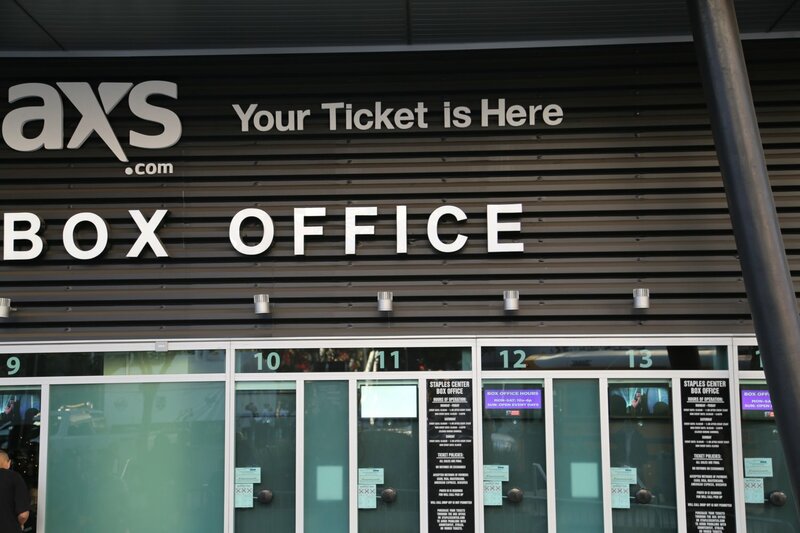 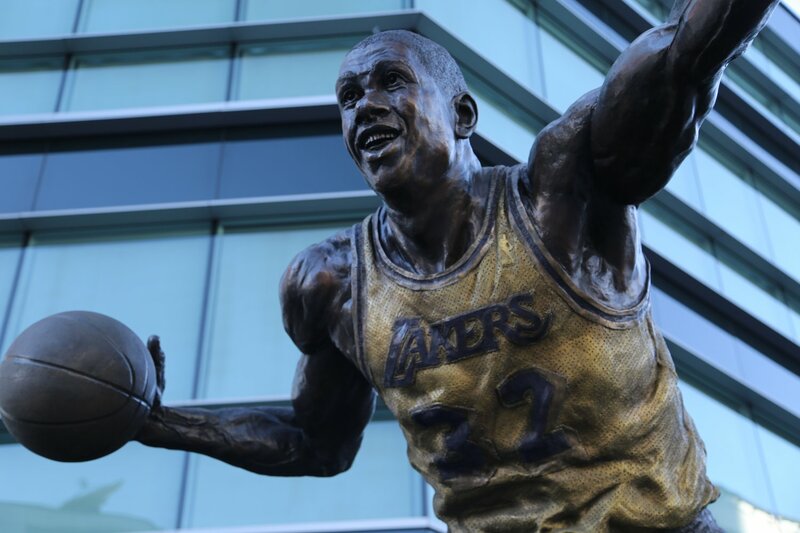 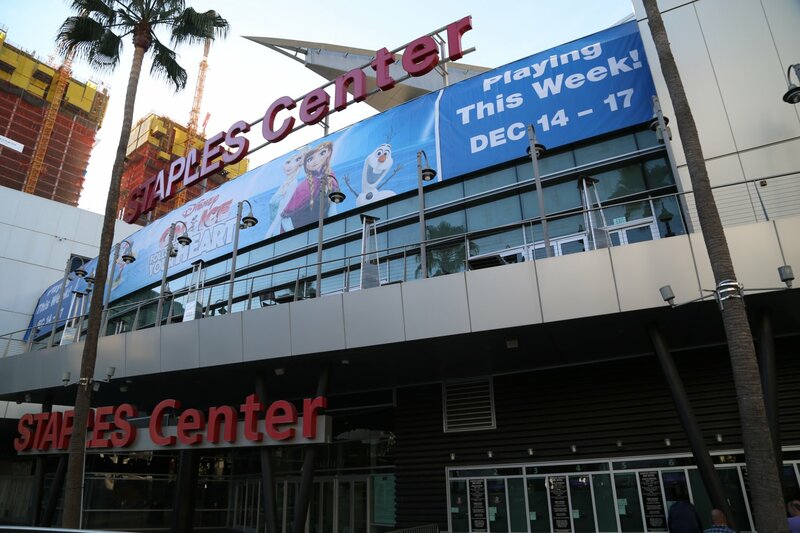 Staples Center is located at 1111 S. Figeroa Street just south and west of downtown proper next to the huge LA Live mega entertainment center and the Convention Center. 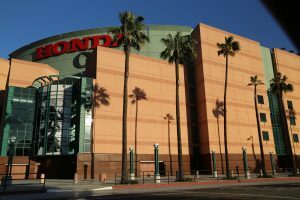 We first attended a business convention here soon after it opened and had the treat to watch the LA Kings hockey team practice. 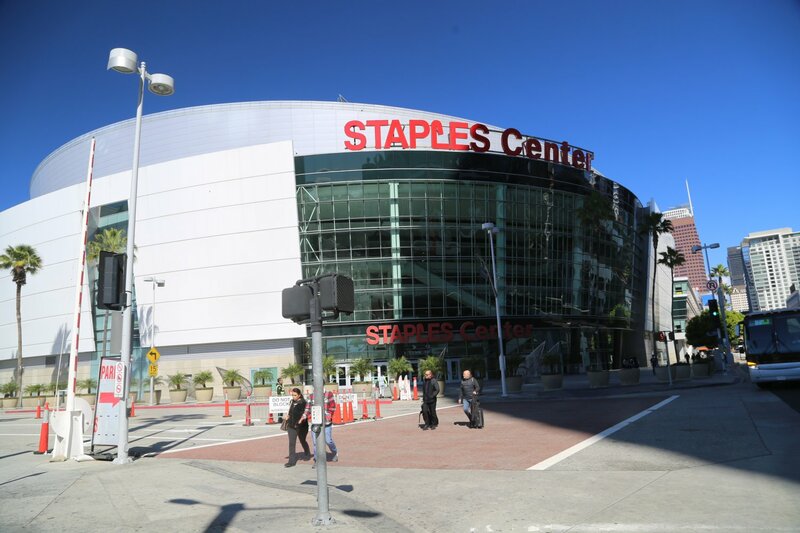 This is a beautiful arena both inside and out that is home to the great Los Angeles Lakers (when they are winning look for those purple and yellow flags flying down the LA freeways! 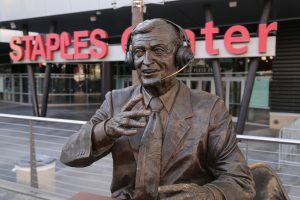 ), the often hapless Los Angeles Clippers, the Los Angeles Kings professional hockey team and the WNBA’s Los Angeles Sparks. 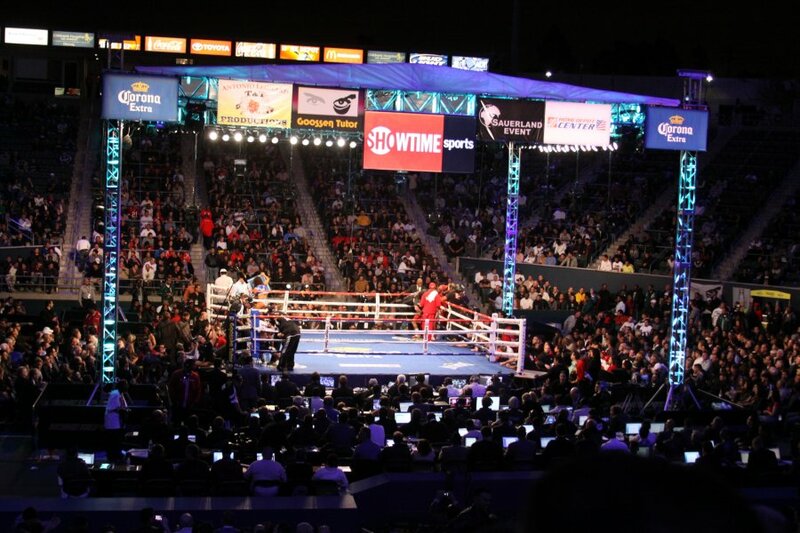 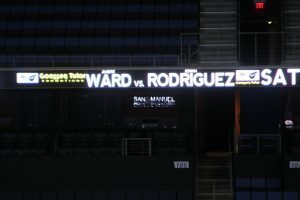 It is also used for major performers, boxing matches and other International special events. 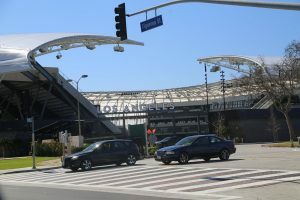 Stubhub Center (formerly the Home Depot Center) is located near both the 110 and the 405 Freeways (near where these freeways intersect) in Carson adjacent to the campus of California State Dominguez Hills. 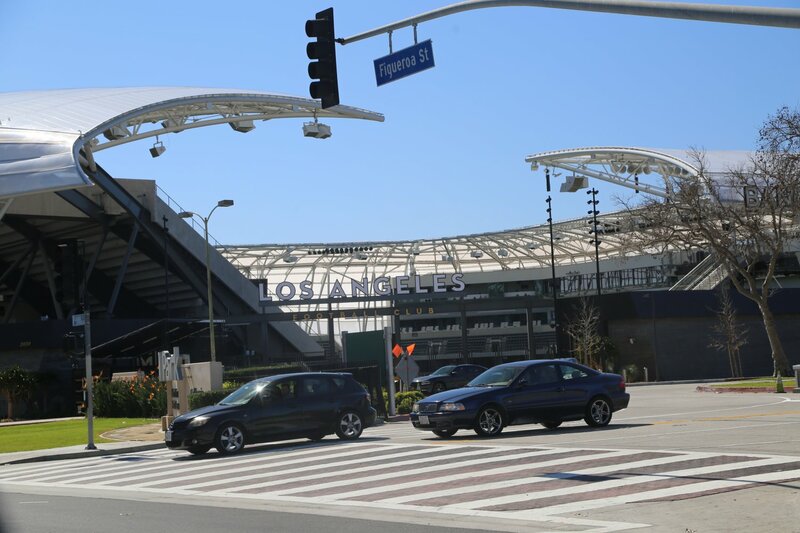 With normal traffic the trip from LAX to this center will take about 20 minutes.